Yesterday I covered a whole bunch of options you have while leveling, but I left out one of the more interesting but unusual systems. Today I am going to delve into the “Log” system as well as provide some guidance for dungeons from the lowest levels all the way through the current content and how to unlock them. Once again it is my goal to make this information far easier to find for new players. Each of us has spent quite a bit of time crawling various sites to gather information about this game, and my hope is to lay things out plainly with the western MMO player in mind. There are several very similar systems in Final Fantasy XIV that are collectively grouped in the logs menu. Each of them involve you somehow exploring the world and performing the tasks mentioned in the logs. In all cases they are worth significant amounts of experience and often times gil as well. Similarly completely them can often times have other rewards as well which I will go into in a bit. 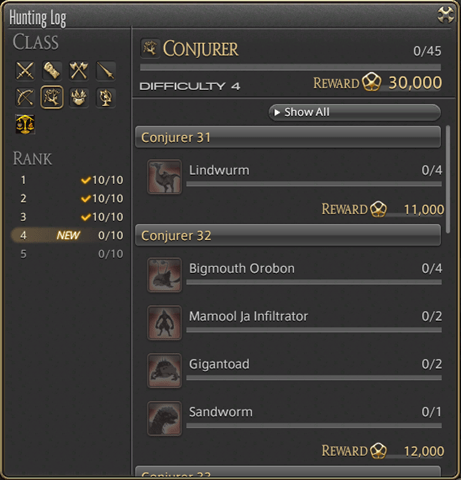 When you talk to your class guild master and accept the introduction quest, you will gain something called a hunt log. The hunt log can be seen on the right hand side of the page, and is a collection of various mobs out in the world that you need to kill along with a number that you need to kill to get full credit. Each time you accomplish a step you are rewarded with a boost of experience. When you complete the entire log for a given level range you get an even larger experience reward. As you move through the game you will get a new set of logs for each 10 levels and you only get the next 10 when you have both leveled into that next range and completed the previous one. When you join your Grand Company of choice you will get an additional log. These however are less level range based and more based on your rank within the Grand Company. Hunt logs in general only require you to fight encounters in the open world. The Grand Company logs however often times include encounters in dungeons. When you have gained enough rank with your Grand Company and are eligible for a promotion, you will often have to have completed a specific log step before being able to promote to the next rank. As far as hunting logs go, when you have completed all of the hunts for a given class you are rewarded with an ilevel 70 class specific ring. While you are going to upgrade out of it pretty quickly, it definitely helps in getting your ilevel up for later content. In the 2.2 patch they added a whole new log system into the game, and for the most part many of us missed it for awhile upon returning. It was not until a guild member talked about waiting for the challenges to reset, that we really grasped what he was talking about. 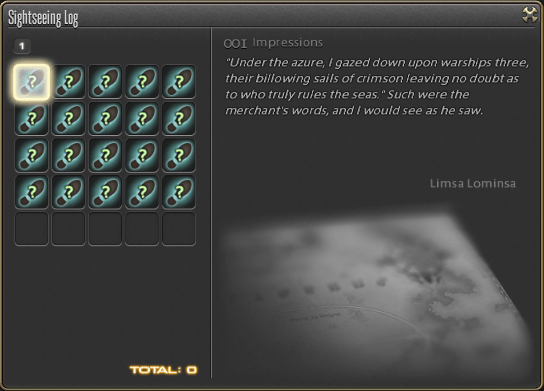 Upon completion of your level 14 main scenario quest, you can go to the docks of Limsa Lominsa and get the quest called Rising to the Challenge. This unlocks the challenge log system which provides a series of relatively simple challenges that reward a significant amount of gil and experience for completion. The challenges are good for a week, and reset each Tuesday morning at 1 am PST. Generally speaking I manage to get a few of the steps completed each week, but it has not been something I have really gone out of my way to accomplish. The Companion steps however are extremely beneficial for leveling purposes. These involve fighting mobs of your level range while having your companion out… which is something you are likely going to be doing anyways. When you complete a step both you and your companion get a much needed experience boost. Since I mostly level through running dungeons, you can see that my dungeon challenges have already been completed, and I am getting very close to reaching my beast tribe dailies. Another interesting system that arrived while we were not playing the game is the Sightseeing Logs. This system is unlocked by completing the level 20 quest A Sight to Behold. While technically not a “leveling” system it is one of the log systems so I thought I would go ahead and mention it. Essentially you are given a block of text as seen above and from there you have to figure out WHERE in the world that location is, as well as what time of day and weather conditions you need to be in. When you find one of these locations you are prompted to use a /slash command generally /lookout but various ones will require various commands. When you perform the action you get credit in your log. There are 80 entries in total, and when you have completed them all you unlock the Fledgling Apkallu pet as well as bragging rights for having completed it. Even if you are using some sort of a guide, getting all 80 locations is a labor of love given they are time and weather specific. As you move through the world you will encounter various beast tribes that hold fealty to one of the primal forces. Generally speaking these are bad people, that you want to shoot first and ask questions later. However within in each of the races there is a rival faction that is friendly to players. After completing an introduction quest you unlock the ability to do daily quests for them allowing you to gain favor with their tribe. There are many reasons why you would want to do this, but the most obvious are that they unlock interesting pets, mounts and cosmetic gear. Each player can only complete six daily quests per day, and these reset around 11 am CST from my experience. At the lowest rank with each tribe you can only complete 3 quests per day, but upon unlocking the next rank you start receiving the full compliment of 6 quests. Currently I am working on the Sylph tribal quests myself for the ability to get my own Goobue to ride upon. Here is a quick rundown of the various tribes, and the location and start of the quest chain. As I mentioned as a footnote above on the Ixali quests, they are almost entirely crafting level dependant. I believe you need to have a combat class around 40 to gather some of the materials needed for the quests, but for the most part they are going to require you to craft various things. 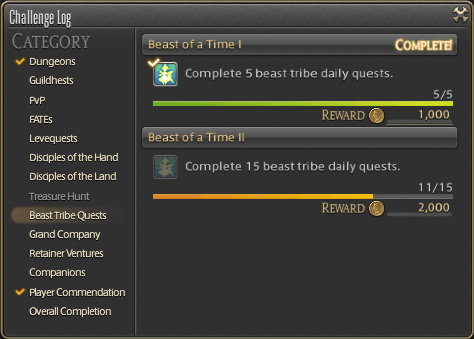 In any case the beast tribe dailies are an excellent way to boost your leveling post 41 by completing some quests worth a decent chunk of experience. As I have said a few times, my personal favorite way to level is through dungeons. For me at least it is the dungeon content where this game really shines. The encounters are interesting and difficult, and at the same time highly rewarding in both gear and experience. The vast majority of the dungeons are gated through the main quest line, however there are a number of dungeons that are considered “optional” and unlocked through other means. My hope is with this list to compile in one place how to get into each of the dungeons and what their level range is. Hopefully that gives you an idea of some more leveling options. In a later post I will get into raiding and how the various gearing systems work for end game content. For the time being I am going to close off this post for the day. I am hoping you are finding them useful, and please let me know if there are other things you would like to see. Tomorrow will be a normal Aggronaut post and I will likely be taking a break from this guide series until later in the week. Thanks for reading! Challenge logs… hm,m, not sure I have seen those and I’ve been back for a month at least! Mystical, it’s completely up to you on how you want to level your cross classes. At the very least get marauder to 8 for bloodbath. If this is your first time through it may be fun to stay on one class through the storyline, I enjoyed doing it that way. Again, there is no strict way, do what you enjoy. I’m currently leveling GLD in preparation for life as a future PLD. I’ve read that GLD 34, CNJ 34, MRD 26 will get me my cross-class abilities the fastest. Would you recommend doing it this way or would you take GLD to 50 first?